If you're planning for the arrival of a little one or want to create a homemade baby gift for a friend or family member, free sewing patterns can come in handy. From booties to bibs, there are lots of free designs that can help you create something really special. If you need help downloading the patterns, check out these helpful tips. Print this free bootie pattern! This simple pattern is perfect for the beginning seamstress. It creates a sweet pair of booties that will fit babies from six to 12 months of age. Print out the pattern for the bootie and cut out the pieces of microfleece. Fold over one long side of the heel piece by half an inch. Use the sewing machine to sew a quarter-inch channel. Pin one short side of the heel piece to one end of the flat part of the toe piece, right sides together. Using a quarter-inch seam allowance, sew the pieces together. Stop before you reach the channel you made. Using a safety pin, insert the elastic into the channel of the heel piece. Adjust the elastic so that the end is even with the end of the channel. Pin and sew to the toe piece. Pull the elastic through the channel, gathering the fabric, until you have used three and a half inches of elastic. Pin to secure. Pin the remaining short side of the heel piece to the other end of the flat side of the toe piece, right sides together. Sew to secure. Turn over the middle portion of the straight side of the toe piece and use the machine to hem. Cut a one-inch piece of ribbon and notch the end. Pin the ribbon to the center form of the bootie toe. Pin the sole piece to the rest of the bootie, making sure the ribbon tongue is located between the layers. Thread your embroidery needle with floss and use a blanket stitch to secure the sole of the bootie, allowing for a quarter-inch seam. Securely hand sew two buttons on the bootie for eyes. Repeat steps to create the matching bootie. Print this free swaddle pouch pattern! 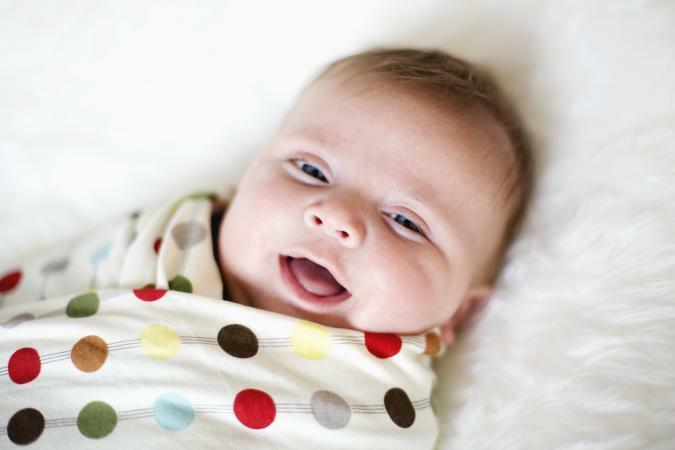 Many newborns love to be swaddled, but the swaddling procedure can be a bit confusing for sleep-deprived new parents. This swaddle pouch takes the guesswork out of swaddling and is easy for a beginning seamstress to make. It will fit newborns to three-month-olds. 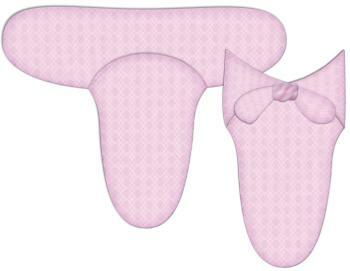 Print the swaddle pouch pattern and cut out the pieces of fabric. Cut one of each fabric. Taking both pieces for one of the fabrics, pin the front of the swaddle pouch to the back, right sides together. 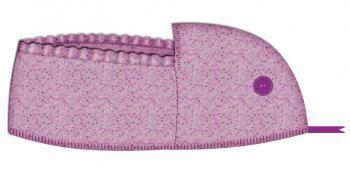 Sew around the curved bottom to create a pouch, leaving a quarter-inch seam allowance. Repeat with the pieces of the other fabric. You should now have two pouches, one in each color. Turn one pouch right side out. Nest the pouches with the wrong sides together. Adjust so that the side seams match up and the outer edges of the fabric are even. Pin the seam binding around the edge of the swaddle pouch, covering all raw fabric edges and securing the two layers together. Top stitch to sew in place. To use the swaddle pouch, slip the infant into the pouch portion and securely tie the two wings in front. LoveToKnow Sewing has a great library of free patterns for babies. You can also use these other designs to create a special baby gift or complete your little one's layette. If you love quilting, why not put your skills to use in a baby-sized bed covering? 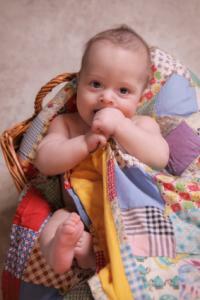 Use free baby quilt patterns to make a special quilt to match the baby's nursery. You'll find designs for both boys and girls. A bib or burp cloth makes a practical gift for any little one. You can make an heirloom embroidered bib or an easy-clean bib for catching messes with free baby bib sewing patterns. You can also learn how to sew burp cloths to keep mom and baby clean. Either way, baby will be cuter than ever. Baby clothing is adorable but expensive. Learn how to sew baby clothes and use free patterns to make everything from micro preemie clothes to heirloom outfits. There's nothing worse than having a baby drop his pacifier on the ground and realizing you don't have a spare. Use a pacifier holder sewing pattern to create an easy solution for this common problem. Toys make great gifts, especially when they're handmade. Use free patterns for stuffed toys to make everything from a teddy bear to a soft textured baby block. You can also make baby-safe cloth dolls for a little one who needs a special friend. Free Baby Patterns from Voor Nop - This pattern site provides a large number of baby and toddler clothing patterns from dresses and pants to sleepers and shirts. Make Baby Stuff - This sewing site has patterns for dresses and pants, many with sweet appliques. AllCrafts - Find sewing patterns for everything from car seat covers to clothing for all skill levels. Free Needle - This popular free pattern site has an extensive library of wonderful baby patterns. Before you decide on a design, read all of the instructions that go with the pattern. They should be clear and easy to follow, making it less likely you'll end up getting confused as you work. Make sure you understand each step before you begin. Although many patterns are perfect for beginners, some designs may be too complicated and frustrating. Take a moment to check out the guidelines to see if the pattern matches your level of experience. Since you'll be putting a lot of time and energy into this project, choose a design you really love. There are lots of beautiful patterns out there to choose from, and the perfect design is one you're excited to make. No matter which design you choose, you'll find that making your own baby clothing and gifts is both practical and rewarding. There's nothing cuter than seeing a sweet baby using an item you sewed yourself.